There’s a lot to be said for colors that are really saturated and intense. Fun and bright. They can make us really happy. Or they can be overwhelming. Colors can also be trendy and can become tiresome after a while. So how can we live with the colors we love and not be overwhelmed by them? How can we enjoy color without overcommitting? I have an idea, and it revolves around a very neutral palate created by one of my very favorite colors… white. Yes white. I could go on and on about white. I love it. For now though, just a few examples of how white can be your best friend when it comes to enjoying your favorite, most vivid, vibrant colors. It has been a super hot color for years. We’ve seen it everywhere. Isn’t this fantastic? I am in love with this bedroom. Soothing and calm and clean and then… hello ceiling! It’s like a wonderful surprise waiting for you when you look up. 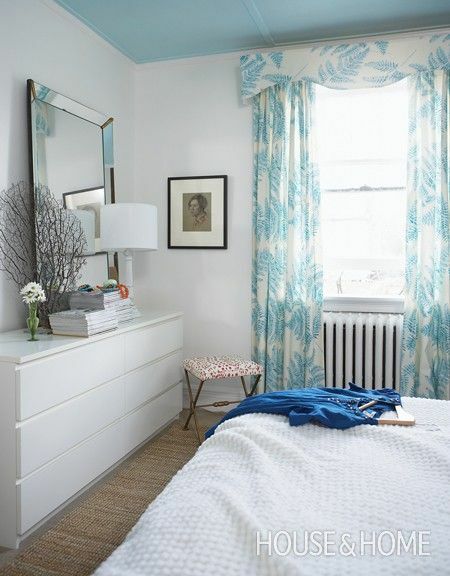 You still get your turquoise, but it’s much more subtle, livable and (I think) long lasting. And if you’re a turquoise lover you owe it to yourself to visit House of Turquoise, a wonderful blog dedicated to beautiful interiors that feature turquoise in some way. Beautiful! Bold but not over the top. Just enough punch to keep the room exciting. Aren’t we all craving some green this time of year? So happy and spring-like. Would this suit your fancy? Or could you get your green fix with just a few well placed accents? 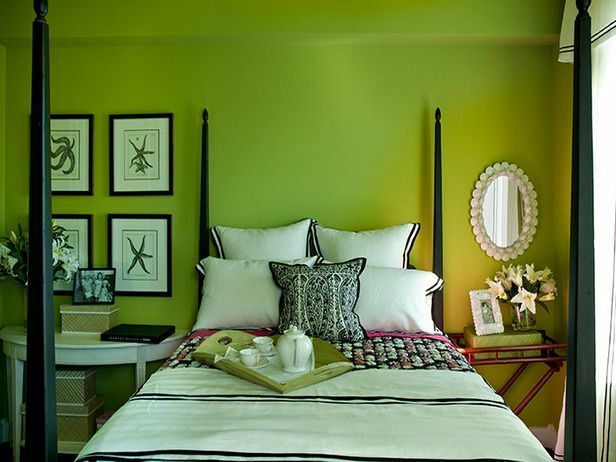 Did you notice how well green works with black and white in both of these rooms? And last but not least. The happiest and sunniest of all colors. Yellow. It really never goes out of style, just gets remixed and paired with different colors. 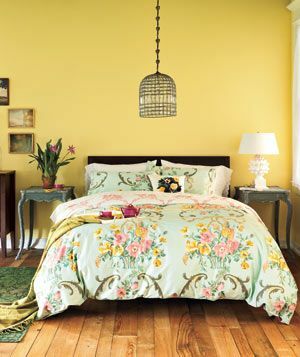 A yellow room could be just divine. Tell me this didn’t make you smile. Amazing, right? If you take a second look, pretty much everything is white except some of the bedding and that absolutely fantastic artwork over the bed. 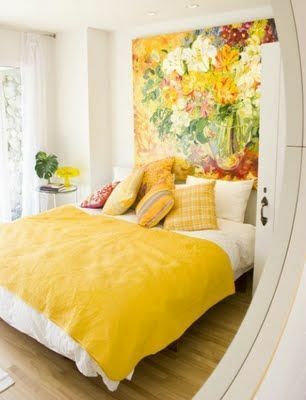 So it’s not a yellow room, it’s really a white room with some well placed yellow accents. Do you love it? I do. I’m not trying to talk you into anything here. Or talk you out of anything. 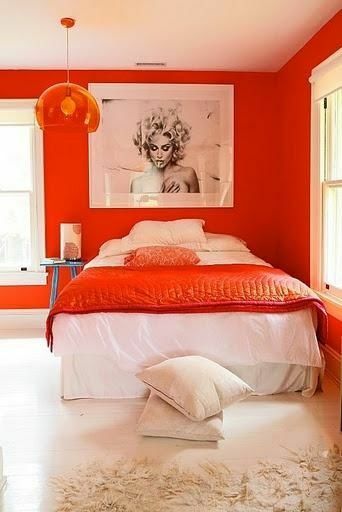 Just trying to get you to consider ways of getting some color into your home without necessarily painting it on the walls. Are you all in when it comes to color or are you more the accenting type? Both are good as long as you are doing something that makes you happier at home! 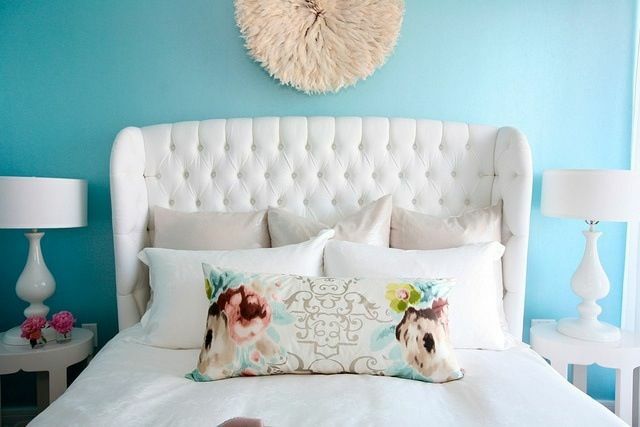 The turquoise and white is definitely a favorite. Great post! Wow! Just Wow! You have such an amazing way of expressing yourself with all of these blogs, you’ve talked me into all of them (unfortunately my bank account doesn’t agree!). One day soon I’m going to put some of these into action. Can you write one on what to do with a big blank wall? Thank you so much Lizzie!!! Blank wall post coming up soon. XOXO!! Previous PostIs your house having a mid-life crisis? Next PostWe are 3! And a birthday before and after.